Last week my mom posted a salad on Facebook that reminded me of a salad that I hadn’t made in a while. This salad is so colorful and flavorful. 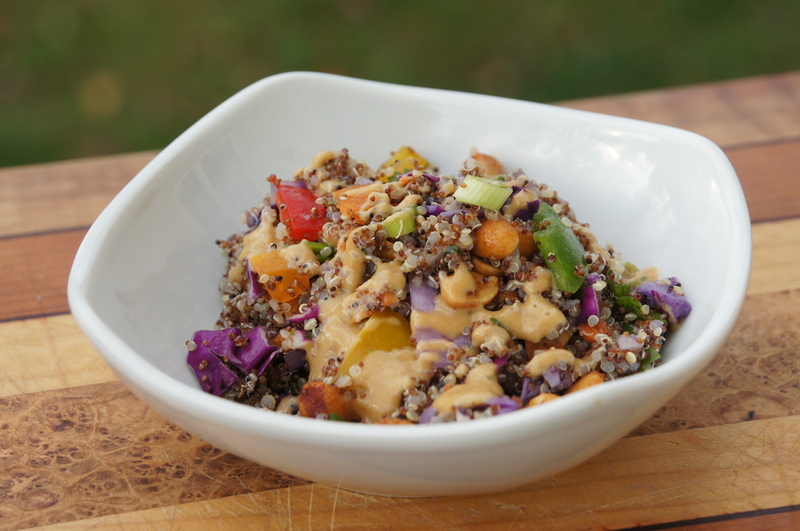 The quinoa and kaniwa give the salad a nutty taste and the cabbage gives it an awesome crunch. The colors of “rainbow” come naturally in this salad. Red: red peppers. red onion. Orange: Orange peppers and carrots. Yellow: Yellow peppers. Green: green peppers, green onions and edame. Blue: only color missing in this salad. Purple; red cabbage. This salad is great alone, but is also fantastic in a wrap. My my family ate it in a soft shell taco with grilled tikka chicken. Cook quinoa and kaniwa as directed on package and set aside to cool. For the salad dressing: In microwave safe bowl microwave honey and peanut butter for about 20 seconds until melted. Stir. If not melted return to microwave for a few more seconds. Poor honey peanut butter mixture in a blender with remaining ingredients and blend until smooth. Add water as necessary to thin.